Billy drank alcohol only on special occasions, so most evenings in Urumqi I went alone to the one western-style bar in the city. It was owned by Hiro, a stocky, long-haired Japanese guy with a goatee, and Manus, a laidback Irishman who was tall and thin with a shaved head. Both were eight-year veterans of Urumqi who had first arrived as language teachers. Their bar functioned as a gathering place for the city’s tiny foreign community, who were mostly students or taught English, and passing travellers. But, uniquely for Urumqi, it was a place where Uighurs and Chinese drank side by side. The bar attracted a crowd who could be described as Urumqi’s bohemians, people whose work brought them into contact with westerners or those who had rejected the local entertainment options. Uighurs patronise dance clubs no Chinese will step into for fear of being stabbed, and which are dangerous too for foreigners who try it on with the Uighur women. Han head to the karaoke joints or the Chinese bars, where whisky is bought by the bottle and mixed with green tea and endless games of liar’s dice are played, with the losers downing their drinks in one as punishment. Spending a night at the bar was to rewind back through the centuries to when Urumqi was a crucible of races and religions. It was a modern-day version of the caravanserai, the inns along the Silk Road where merchants and travellers from the Middle East, central Asia, India and China had spent their nights telling tales around open fires. Indeed, some of the bar’s customers were traders from central Asia and Russia, lured to Urumqi not by the promise of rare spices and exotic inventions but by the low cost of more prosaic items such as furniture and household appliances. Their increasing presence in Xinjiang is a sign a new Silk Road is emerging. It is one where the cheap clothes and goods churned out by the factories in the south and east of China head west via Urumqi, while the natural resources of central Asia travel in the opposite direction. Come dawn, though, and the bar’s cosmopolitan atmosphere seemed fantastic, a mix of races that belied the reality of life in Urumqi. It was as if the desert sun illuminated the true nature of the relationship between the Chinese and the Uighurs, while the night sky cloaked it, because there was a palpable tension on the streets during the day. You could see it in the eyes of the police sitting in their vans scanning passing pedestrians, and the security guards who stood outside the banks and big shops. Whenever there were Han and Uighurs in the same vicinity their mutual loathing was obvious. So polarised are they that they look straight through each other, as if that Uighur selling sweet apples or the Chinese newspaper vendor didn’t exist. But in the centre of Urumqi the Han and Uighurs have to walk the same streets every day, and there is always the sense that it would take very little for the barely suppressed hatred on both sides to explode. 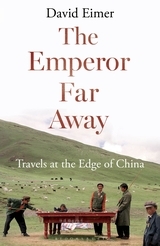 This is an edited extract from The Emperor Far Away: Travels at the Edge of China by David Eimer, published in paperback by Bloomsbury.